This feature on the history (and legends) of "Heather Ale" was contributed by Huntingtower (a name associated with a castle near Perth). You can see his own Web site here. Heather Ale, believed to have been drunk since around 2000 BC and reputed to be one of the oldest styles of ales in the world, is beginning to enjoy a renewed interest since the re-introduction of the long forgotten style and art of making the brew a few years ago. Made from the flowering tips of wild purple heather, boiled with Scottish malts and wild myrtle leaves in order to extract the flavour and nectar, it has been described as being "Full and of Firm character with a Floral, Peaty Fruity aroma with a dry Wine-like taste." 2000 BC, The Isle of Rhum: A Neolithic shard is discovered by Archaeologists. It contains traces of a fermented beverage made with heather flowers. 325 BC, Pictland: More commonly the lands north of the Forth-Clyde valley where the Picts who were accomplished brewers. They brewed some awful grand drink they called "heather ale" from heather and some unknown kind of "fog." 843 AD, Scots and Picts united: The Scots King Kenneth MacAlpine defeated the Picts to form 'Scotland' or 'Alba' to the Gaels. Throughout medieval times many ceilidh stories mention the brewing and drinking of heather ale. This folklore includes the tale of a Highland clan warming heather ale over the fire on a cold night. The steam from the hot ale cooled against the stone roof and dripped into a drinking cup. Upon drinking the contents, the Gaelic clansmen exclaimed 'Uisge-beatha' convinced they had experienced the fabled "water of life". Uisge had been discovered that night. This word has since entered the English language as 'Whisky'. 1707 AD, The Act of Union: After centuries of war Scotland became part of the United Kingdom of Great Britain. Despite many wars of independence and Highland uprisings, Scotland had lost its freedom. Many atrocities were passed through Parliament during the 18th century, outlawed was the wearing of tartan, playing bagpipes and Highland gatherings. Lands were stolen from crofters, Gaelic was forbidden and clans were persecuted - a whole culture and way of life was virtually destroyed. An Act was passed which prevented brewers using any ingredients other than hops and malt. Hops cannot grow in Scotland (indeed there is no Gaelic word for hops) and heather ale was all but reduced to legend. 1809 AD: In the Highlands and Western Isles the brewing of heather ale continued, as did the wearing of tartan and the Gaelic language. They held on to their traditions and customs including the manufacture of illicit "uisge-beatha". 1775 AD, Whisky Distilling Legalised:After many decades of illicit stills, the Glenturret Distillery in Perthshire becomes the oldest (authorised) distillery in Scotland. It was established in 1775 although illicit stills on the site date back to 1717. It is also one of the smallest, with only one pot still - the traditional method of making whisky. 1880 AD, Robert Louis Stevenson wrote a poem entitled "Heather Ale" - you can read this in the Poetry Section of Rampant Scotland. 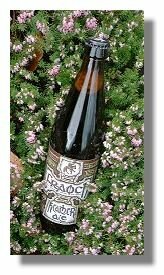 1986 AD, Heather Ale Revived: In a Glasgow home-brew shop, a Gaelic-speaking Islander translated an old family recipe for "Leann fraoich" to Bruce Williams, the shop owner. He began the crusade to revive Scotland's brewing heritage by trying different varieties and quantities of heather flowers, making up batches and testing them on his customers. When the formula was perfected he began selling the brew as "Fraoch Leann" (heather ale). 1992 AD, Heather Ale in Production: The first twenty thousand pints were produced at a small West Highland Brewery in Argyll. Sales were restricted to six pubs due to the capacity of the brewery. In 1993, an agreement was reached with Scotland's oldest family brewers, Maclay & Co. at the Thistle Brewery in Alloa which allows Bruce Williams to brew larger quantities during the heather season (July to September). Every batch is inspected and recorded for the Scottish Brewing Archive in Glasgow. Under supervision of The 'Scottish Office' in Edinburgh, the tradition and custom of brewing heather is protected, and Heather ale receives a "Certificate of Specific Character".